Tess Delaney lives a fast-paced life as a provence specialist for the Sheffield Auction house in San Francisco, CA. She has no family, other than her mother Shannon, who is also a career woman with little time for her daughter. On a day where Tess is supposed to have a meeting with the possibility of being promoted, Dominic Rossi steps into her life to inform her that a grandfather she's never known, is hospitalized in a coma and Tess is listed in his will as leaving her half of his estate. 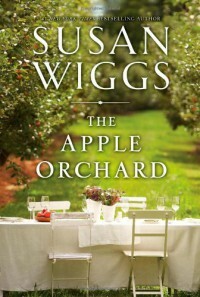 His property is an apple orchard named Bella Vista located in Sonoma County. The other half is willed to a sister she's never known, named Isabel. Tess flies to ArchAngel, CA where the estate is located and meets her sister and discovers much more about the family she's never known. Tess struggles with wanting to return to San Fancisco, her job and way of life there. However, she's also finding that she likes Archangel and the new people she's meeting. This book is filled with family secrets, history, different points of view from different characters, romance and some characters you'll love to hate. In between chapters you'll find recipes that go along with the story. In the beginning I didn't care for Tess's character because she was so preoccupied with her life, but not really 'living' her life. It was nice to see the change in her personality once she acclimated herself to her new surroundings. I enjoyed the flashback chapters which give us background on her grandfather's early life during WWII. I'm glad I waited to read this book because now I can move right into reading the second book in this series called 'The Beekeeper's Ball' which is Isabel's story. I've received an Advanced Reader Copy (ARC) from NetGalley.com and will be reviewing 'The Beekeeper's Ball' in the coming weeks. Feel free to pre-order your copy below!